For the first time in the history of the Hacker Games, the event was organized in the southern region, Alytus. On the last weekend of September, 60 participants came from Kaunas, Vilnius, Alytus and other cities to realize their business ideas. In the main part of the tournament – the Hackathon – 12 teams competed for two top prizes: the most realistic product and the idea that made the most progress. One of the best ideas was the “Economist” project created by 9th–11th grade students – their concept was to create a business simulation platform for schoolchildren to improve their knowledge of economics. As the students said themselves, there is only one comparable simulation platform in the world, but it is not user-friendly and does not reflect real business development, so their main challenge is to make this platform as realistic as possible. “Both in terms of design and software capabilities, our only competition is not as modern as our product. In order to be able to predict the different situations that students doing a business simulation will face as accurately and realistically as possible, we are planning to involve teachers and specialists from different fields. When you register in our system, you currently get the company’s starting capital and you can buy or sell goods. 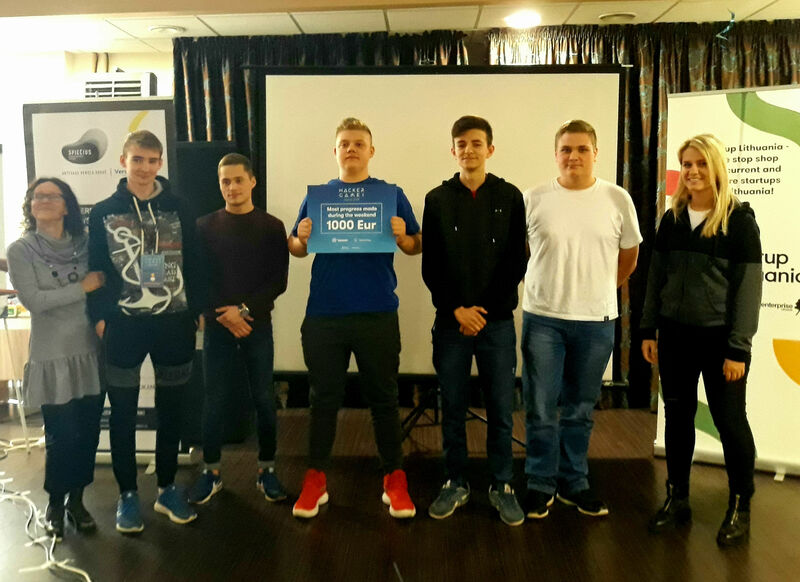 In the future, we plan to improve the system so that it can simulate logistical processes,” explain the students from Alytus Adolfas Ramanauskas-Vanagas Gymnasium. The second main prize went to the “DataBee” idea, which aims to address the issue of personal data protection for both the user and business by using an elementary browser extension. “The essence of our product is to ensure privacy on behalf of the user and the business, taking all national and international personal data protection laws into account. The problem is that once these regulations were introduced, no unified business development and customer reach system was created that could integrate without barriers into each company’s business environment without losing any existing customers,” says Dalius Rupainis, who came up with the DataBee idea. In addressing this situation, DataBee has developed a product – a browser extension – that users can download to declare their consent to receive advertising or other information, and this data is only visible to businesses that have purchased the right to this extension’s information. “We hope that this product will help simplify the management of personal data protection and ensure that those who do not have access to it will not be able to use any sensitive personal data,” notes Mr. Rupainis. For the first time in the history of the Hackathon, there was a programming competition for 6th grade students. Five teams competed in the creative workshop children’s group; in just a short period of time, the teams used micro:bit computers to program a compass, a smart lock system, a toy robot and other solutions. During the contest, a team of five information technology teachers assisted the children. According to Zydrūnas Tautvydas, an IT teacher at Panemunė Progymnasium, schoolchildren have the potential to create future start-ups due to their passion for information technology.